Use this Roux Recipe to make a perfect thickener. 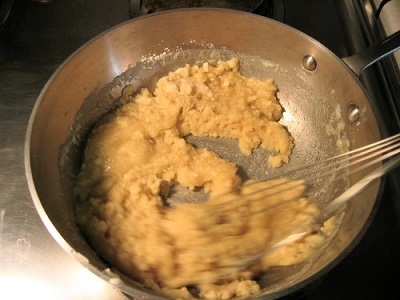 A roux is a cooked mixture of flour and oil, fat or butter that is used to thicken liquids such as soups, stews, sauces - such as the classical Béchamel Sauce and gravies. You will find many recipes that ask you to thicken a liquid. 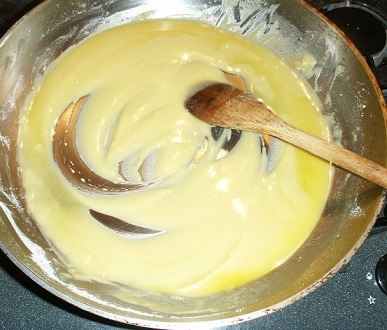 This page explains what that means, how to make a roux and how to use it. Roux is most often made with equal parts of flour and butter, although vegetable oils are used frequently and cooking fats from bacon or meats are often used for gravies. The mixture is cooked by heating (melting) the fat and then adding an equivalent amount of flour while stirring constantly over heat in a pot or pan until the raw flour taste no longer exists. This process results in a thickening and flavoring agent we call "roux." The roux can be white (light) in color or blond or varying shades of brown to almost (but not) black, depending on how long it is cooked (the longer it is cooked, the darker the color) and its intended use. Making a light mixture is simple, but there is a danger of burning a dark one, especially if it is attempted over high heat. Darker ones are often made with vegetable oil or peanut oil in an effort to reduce the risk of burning. A darker roux adds a nutty or smoky flavor to a dish and are used in Cajun and Creole cuisine for gumbos and stews. The darker the mixture, the less thickening power it has. A properly made roux should be stiff, not runny or easily pourable. The recipe below will give you a white roux and you can store the unused roux in a covered container in your refrigerator for several weeks to use for other dishes. That's all there is to making a light (white) roux recipe. How do you add roux to thicken a soup or stew or sauce? Note: If the liquid is to simmer for a long time, under thicken it because the liquid will thicken as it reduces from cooking. For One Gallon of Soup, Stew or Sauce? Now you have a roux recipe and you know what you need to be able to thicken your soups, stews and sauces like the chef you are! Enjoy! And thanks for visiting! Did you know? 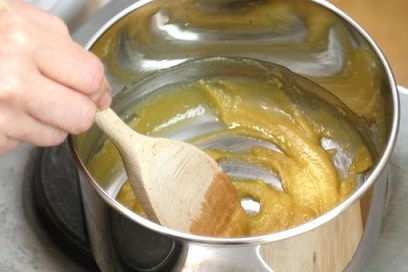 When used in Italian food, roux is traditionally equal parts of butter and flour by weight. In Cajun cuisine, roux is made with bacon fat or oil instead of butter and is dark brown in color, which lends much richness of flavor but has less thickening power.